and in some cases, to make the skills easier to do, write these page numbers/notes at these pages. Or for longer notes just print this webpage, cut out paragraphs and paste them into your manual. I am also including some extra notes on subjects of interest. At the top of page 148 next to the word Entries, write: see pages 169-170. Page 149 next to the word Assists, write: see pages 171-172. Page 150 next to write: Rescuing a Victim at or Near the Surface write 173-179. Page 151 next to Rescuing a Submerged Victim write: 180-184. Page 152 next to Multiple-Victim Rescue write: 179. Page 152 next to Removal from Water write: 185-191. Page 153 next to Using a Rescue Board write: 192-195. Page 159, at the end of step #2, write: But don’t let any air escape from your nose. Page 161 next to Escapes write: 198. Page 161 next to In-Water Ventilations write: 199.
top of page 176 write: Any person who wants to float without moving should signal that they are okay by giving a ‘thumbs-up’ signal so the lifeguards will know they are okay. Even if others at the pool you are at are not familiar with this courtesy, they should be able to understand it. at (step 1 page 176) write: Since some people fake a passive drowning, you can determine consciousness by quickly splashing and yell HEY at the victim as you approach them . Page 177 write: The text says, at step 3, “Grab the rescue tube, if you are using one, and position it under the victim’s shoulders.” But placing it literally under their shoulders will not allow the victim’s head to “naturally fall back into an open-airway position.” Note that the rescue tube is under the victim’s back below the shoulders in photo number 2. 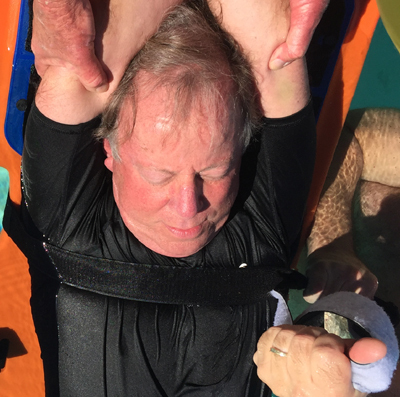 With two victims of relatively the same size, if you rescue the person doing the grabbing, the one they grabbed may be able to swim on their own once you have rescued/supported both of them. page 180 write: The text says, at step 4, “Grab the rescue tube and position it under the victim’s shoulders.” But placing it literally under their shoulders will not allow the “victim’s head to fall back naturally into an open-airway position.” Note that the rescue tube is under the victim’s back below the shoulders in photo number 3. Page 183 #1 write: a head-first surface dive is okay to use. Page 183, step 4 write: many people find it easier to grab the end of the line to the rescue tube, right where it attaches to the rescue tube, as they position the tube between themselves and the victim. This is especially true with wide rescue tubes and small hands. Page 186, step 5. It can be easier during the pull/push of the backboard onto the deck if you try to get the board as horizontal as possible as soon as possible, rather than trying to push/pull it at an angle. It can also be easier, especially with a heavy victim, to slide the board up onto the deck about 60% of the way, then let it down onto the deck and then slide it the rest of the way flat along the deck, instead of lifting the entire weight of the board and victim for the entire distance. In shallow water the guard in the water might find it more effective to push up with one knee on the bottom end of the board while standing with the other foot on the bottom OR s/he can stand at the end of the board and let the end rest on their waist line/stomach as they walk forward for part of the push. Page 186 step 5 write: With a heavy victim this can be easier with a second strap around their upper legs, but this is not recommended for a timed test required for certification, or an employment pre-test with a required time. Page 187 step 5 write: With a heavy victim this can be easier with a second strap around their upper legs, but this is not recommended for a timed test required for certification, or an employment pre-test with a required time. At top of page 209 write: see Removing Gloves page 223. Page 213 next to Emergency Moves write: 227-228. Page 213 next to Perform a Primary Assessment write: 229-230. Page 216 next to Using a Resuscitation Mask to Give Ventilations write: 224-226. Page 230 step 6 at the words If victim is not breathing and has no pulse, begin CPR starting with compressions, write One-Rescuer CPR pages 291-292, Two-Rescuer CPR Adult pages 293-294, Infant pages 295-296. Page 237 next to Giving Ventilations write: 259-260. Page 238 next to Resuscitation Masks write: 224-226. Page 239 next to Bag-Valve-Mask Resuscitators write: 261-262. Page 245 next to Caring for an Adult or Child Airway Obstruction write: 263-265. Page 246 next to Caring for an Infant Airway Obstruction write: 266-7. Page 246, below figure 8-12 write: If the conscious choking victim is much taller than you and you can’t get into a proper position to give back blows and/or abdominal thrusts, you can ask them to kneel. Page 246, left hand side, second box, below where it says “Use chest thrusts if you cannot reach around the victim or the victim is pregnant”, write: if the victim is in a wheelchair and the features of the wheelchair make it difficult for you to give abdominal thrusts, even if you kneel behind them, give chest thrusts instead. At bottom of page 247 write: see also CPR with Airway Obstruction pages 299-300. Page 248 next to Emergency Oxygen write: 269. Page 253 next to Suctioning write: 270. Page 276 write: One-Rescuer CPR pages 291-292. Page 277 next to Two-Rescuer CPR write: Adult pages 293-294, Infant pages 295-296. Page 281, below figure 9-6, write: dripping wet lifeguards need to dry off before they drip on the victim’s chest, or a dry lifeguard not involved in the water rescue needs to attach the pads and operate the aed. Page 304 next to SAMPLE write: page 338. Page 305 next to Checking a Responsive Person write: pages 335-336. Page 312 next to Caring for External Bleeding write: page 337. Page 337 at the bottom of the page write: steps to minimize shock are at the bottom of page 314, steps to apply a manufactured tourniquet are on page 313. Page 342 at the bottom left-hand column where it says “If the victim is not breathing” write: see also Jaw Thrust (without head extension) page 226. At top of Page 343 write: Head splint pages 359-365. At the bottom of page 345 write: the backboard shown is a CJ1000 Spine Board (also known as a CJ Backboard System). If your facility has a CJ Rescue 6 Spine Board (plastic) you might want to experiment with adding two more flotation rods to it and then trying the skills in this manual before and after the extra rods are put in, at various heights of gutters/walls, etc. Page 346 next to Spinal Backboarding Procedure write: 366-367. Page 346 next to High Edges write: 368-369. Page 349 next to Speed Slides write: 370-371. Sorry, little spare time . . . NOT ALL of the typos we (myself and three other lifeguards who are also lifeguard instructors / one other Lifeguard Instructor-Trainer) found, or things that seem to be missing/out of place, are listed at this page. The manual is used for Waterfront Lifeguard (“non-surf, open water areas found at public parks, resorts, summer camps, and campgrounds)” as well as swimming pool lifeguard training. These are the pages to especially review before a WATERFRONT LIFEGUARDING class, in about the order they will be lectured on. (Yes, you will notice that some pages repeat.) 34, 35, water quality 37, 32, 43, 36, thermocline and gasp reflex page 166, 36, 155 cross bearing, 156-7 search, 76 watercraft, 109, 100-101,103-4 buddy systems,109, 125, 124, 176 run and swim entry, 190 walking assist, 190 beach drag, and 365 head-splint, 158 fitting a mask, 160 entering with mask and fins, 157 searching deep water, 192, 193, 194. 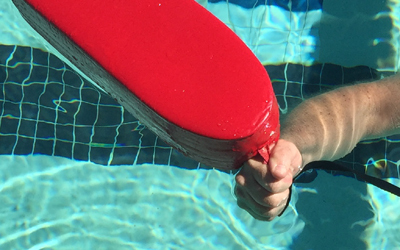 Lifeguard Training FAQS has advice on how to pass the prerequisite swim tests. Some of these are designed for an in-service training project, or perhaps for lifeguard candidates who look at this page to consider on their own.